ALL RIGHT. I know I say this every time, but I ♥ Tu Books. 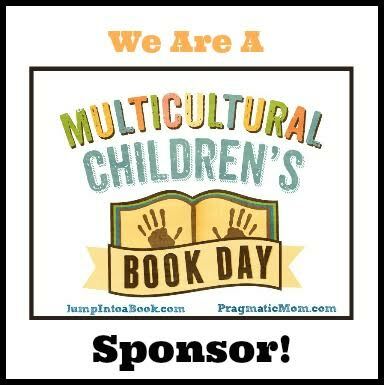 It's just the kind of publishing company so many people were waiting for - because where else can you tell your crazy YA tales of monsters, the Malleus Maleficarum - the Spanish Inquisition's even less sane younger sibling, Christopher Columbus, golems, and djinns? Where else are you going to find magical realism in the fifteenth century? Nowhere else but Tu, people. Concerning Character: Baltasar Infante wears buffoonery like a prickly hair shirt. It keeps the blood loss down, anyway. His parents died for their Judaism in the Inquisition, despite having changed their names and converted to Catholicism, and to save his hide, Baltasar will make fun of anything and anyone to stay out of trouble. Inviting laughter at his own expense is safe - he's dark-skinned and Jewish, and he knows pretty well that in Spain, in The Age of Discovery, which is what historians later called the 15th Century, that different just gets you bullied, enslaved, or dead. Might as well have a sense of humor, no? His uncles jokes and stories are the endless, repetitive and aggravating embroidery on the edges of his day. An indifferent apprentice scribe, Baltasar prefers to escape the house and go to town - and there, trouble finds him again. Even though it makes him bitter and ashamed each time he has to whip out a Jew-joke, Baltasar does it. Unfortunately, sometimes jokes don't save us. When the Malleus Maleficarum come hammering, they raze his whole house to find him. Terrified for his aunt and uncle, in pain and in fear of death, Baltasar is demanded to reveal his name, and the names of his family. His shock - and agony - when he's told he's answered wrongly -- even though he's telling what he knows to be the truth -- is nothing compared to the horror that the vicious priests expect him to reveal the location of a fairytale sorcerer of immense power, Amir al-Katib. But, Amir al-Katib is only a character in one of his uncle's endless tales... isn't he? How can Baltasar be expected to find a fairytale? And really, why are they asking him? Baltasar soon discovers what his parents and his aunt and uncle knew: that stories form the fabric of reality, and that woven within the fairytale is the truth of the world. Recommended for Fans Of...: Tales of the fiercely odd and fantastic, including, MISS PEREGRINE'S HOME FOR PECULIAR CHILDREN, by Ransom Riggs; David Almond's SKELLIG; CITY OF BEASTS trilogy, by Isabel Allende; Libba Bray's GEMMA DOYLE trilogy; Jennifer Cervantes, TORTILLA SUN. Authorial Asides:Mławski is one of those names that you stick into Google and receive so many hits on one name that you pretty much figure any additional names are relatives. It's a Polish name for this New York author who has also, according to her blog, lived in Puerto Rico and Connecticut. This is Shana Mlawski's first book. Cover Chatter: There's so much going on in this book that a cover could have gone in any number of ways. While this cover is attention-grabbing and quirky - floating burning girl djinn for the win! - it has other good details -- the medieval style candle holder; the top mast of a sailing vessel, as seen through the open window; the wooden shutter, which was typical of Spanish homes at the time; Baltasar's hair and outfit. My friend Nita's Ferdinand and Isabella paper dolls show 15th century Spanish dress as lots of sleeves, shapeless caps, layered skirts for the ladies, and leggings for the men. Some excellent sketches here. Illustrations of Christopher Columbus show him frequently hatted, but when his head is bare, he sports the chopped pageboy bob like everyone else, and so does Baltasar. Poor people didn't often have the thigh boots and sometimes went without the hose, which was tied above the knee. Soo, essentially? It looked like everyone ran around in long, belted shirts. These sorts of minor details aren't book-killers if missed, but good story is in the details, and a lot of care is shown here to make Baltasar and Hammer memorable. 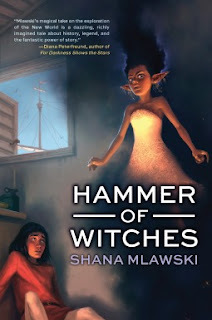 Starting TODAY, you can find HAMMER OF WITCHES by Shana Mlawski online, or at an independent bookstore near you! I am glad I can keep looking forward to this wholeheartedly!